Mouse B7-H3, His Tag (B73-M52H4) is expressed from human 293 cells (HEK293). It contains AA Val 29 - Phe 244 (Accession # NP_598744). The protein has a calculated MW of 25.4 kDa. 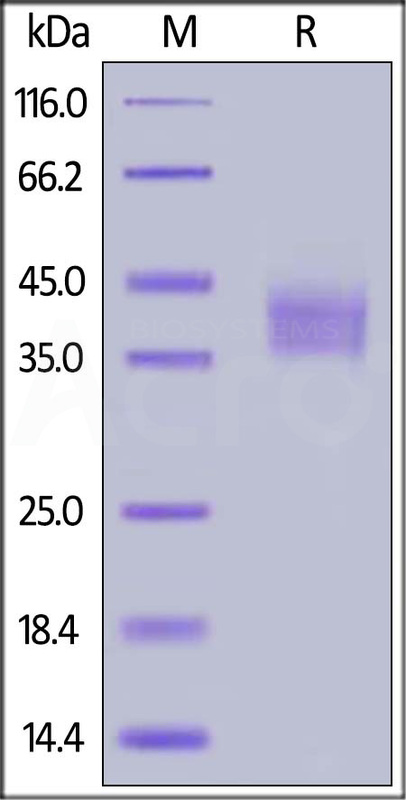 The protein migrates as 40-45 kDa under reducing (R) condition (SDS-PAGE) due to glycosylation. Mouse B7-H3, His Tag on SDS-PAGE under reducing (R) condition. The gel was stained overnight with Coomassie Blue. The purity of the protein is greater than 95%. B7 homolog 3 (B7-H3), a member of the immunoglobulin superfamily, is also known CD276, which contains two Ig-like C2-type (immunoglobulin-like) domains and two Ig-like V-type (immunoglobulin-like) domains. B7-H3 may participate in the regulation of T-cell-mediated immune response. B7-H3 also plays a protective role in tumor cells by inhibiting natural-killer mediated cell lysis as well as a role of marker for detection of neuroblastoma cells. Furthermore, B7-H3 is involved in the development of acute and chronic transplant rejection and in the regulation of lymphocytic activity at mucosal surfaces. It could also play a key role in providing the placenta and fetus with a suitable immunological environment throughout pregnancy. (1) Chapoval A.I., et al., 2001, Nat. Immunol. 2:269-274. (2) Castriconi R., et al., 2004, Proc. Natl. Acad. Sci. U.S.A. 101:12640-12645. (3) Wang L., et al., 2005, Eur. J. Immunol. 35:428-438.